Since that fateful day in Seattle, Tony Romo has established himself as one of the premier quarterbacks in football. Unfortunately for Romo, people don’t forget. The scrutiny of Romo’s supposed “inability” to win big games has lingered, despite all of the accolades he has acquired over the past six years. People always bring up that game at Qwest Field and how Romo’s blunder blew it for the Cowboys. Romo has been invited to three Pro Bowls, set numerous franchise records, and won many games, but the sting of that loss still lingers. Though it is only Week 2, Sunday will be a chance at a little redemption for Romo. Experts constantly harp on how important short-term memory can be in terms of a quarterback’s success. 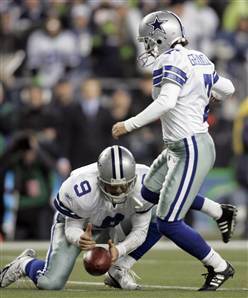 Though this happened nearly six years ago, Romo will have to demonstrate his ability to forget. Sunday will be Romo’s chance to prove that the past is exactly that: the past. The majority of America saw what Romo was capable of on opening night, as he led the Cowboys to a huge victory over the defending champions. In addition, Dallas is already looking to extend Romo’s contract. The organization and ownership have most definitely forgotten about one of the most talked about “bobbles” in NFL history. Has Romo forgotten? You better believe it. Romo recently said, “From that game, it’s like anything in life. From adverse situations you learn from it and get better. You can teach yourself certain things and that was part of it.” He couldn’t have said it any better. The Tony Romo of 2012 is much different from the Tony Romo of January, 2007. Expect him to demonstrate that maturity and short-term memory on Sunday. It will be another “Romo Show” at CenturyLink Field. This entry was posted in NFL and tagged Dallas Cowboys, Drew Bledsoe, Seattle Seahawks, Tom Brady, Tony Romo. Bookmark the permalink.